Hindu Festival Calendar 2019 is presented here along with dates for all the festivals and holidays celebrated in Hindu Religion. Know more on Hindu Holidays and Festivals in 2019. 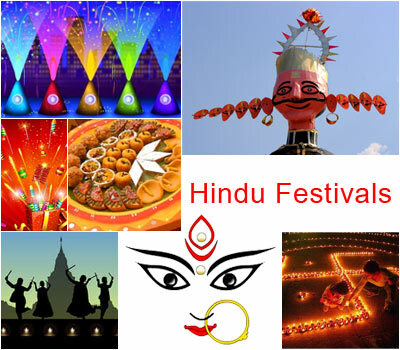 Hindu Festivals - The followers of Hinduism celebrate festivals related to Hindu Gods and ancient Hindu mythology. Hindus celebrate almost everything from birthday of Gods, religious significance to spring festivals such as Holi. Fast and rituals like aarti are a part of these Hindu religious celebrations which may last up to several days. Navratri is one such festival which is observed for almost 9 days twice a year. Some of these festivals are celebrated with great pomp and show across India. Diwali is one such Hindu festival which is celebrated by almost every Indian worldwide. India, the land of varied cultures, ethnic groups, and traditions is a land of festivals and fairs. The country is home to people with diverse religions and faiths. Hinduism however dominates all the other religions and has the longest list of festivals owing to its widespread presence, regional variations, and number of followers. Though, the major Hindu festivals are not just those which call for national holidays. One of the most peculiar features of Hindu festivals is that they encompass almost anything to everything, and that too has a quintessential divine aspect to it. There are celebrations typically for manifestations of gods and goddesses in their varied avtars, death of asuras (demons) and triumph of the gods. Ritualistic feasts are also carried out for seasons, days of the week, planetary events, lunar or solar eclipse and other phases of the moon, vedic principles, and even for creatures like snakes (Nag Panchami). Diwali, Holi, Raksha Bandhan, Dussehra, and Janmashtami are the major Hindu festivals that are celebrated throughout the country with utmost fervor and gusto and involve lots of customs and rituals. Each festival has a deity presiding over it and all the festivities focusing on it. During Navratri, women put on all the adornments and are traditionally dressed up in tones of red, which appeal to Goddess Durga, the presiding deity of the festival.Some festivals celebrate a significant event in the life of a deity e.g. Janmashtami observes the birthday of Lord Krishna, while some are seasonal festivities or customs, like Holi.Some festivals are exclusively regional, like Onam in Kerala, whereas Hindu festivals such as Diwali, Dussehra, and Ganesh Chaturthi are now being celebrated globally. During Hindu festivals, devotees observe rigorous fasts, visit the temple and worship the deities. Distribution of prasad, singing devotional chants (bhajans), decorating houses and temples are other major practices of the day. In a nutshell, each event in Hinduism has religious overtones and legends involving different gods. With abundant holy days, the Hindu almanac is sprinkled considerably with a string of major festivals and a fever of celebrations one after the other. No matter what is the mode of celebration or the reason to celebrate - the Hindu festivals add to the colourful facet of India's cultural diversity, and leave enduring imprints of delight in the minds of people until another festival arrives. List of Hindu festivals and religious celebrations in 2019.